The fact that Obamacare was drafted to be intentionally complex and relied upon what its liberal authors call the “stupidity” of the American voter for its public acceptance comes as no surprise to conservatives who almost universally condemned its promise of lower insurance costs and lower medical costs and more coverage as an unworkable lie. According to The Washington Post, as of this past weekend, there seven Jonathan Gruber videos, in which “the architect” of Obamacare mocks the “stupidity” of American voters and boasts of the Obama administration’s ability to take advantage of it. And here’s an interesting new twist to the Gruber story – universities where Gruber made his outrageous statements about American voters and their presumed stupidity are now taking down the video of those comments. Video which had heretofore been posted on the websites of the various academic conferences during which Gruber made the statements – and his fellow attendees arrogantly chuckled. We see that as a telling comment on the elitism of today’s academia – who no doubt share Gruber’s views and wish to protect Gruber – who is after all one of them; a professor of economics at the prestigious Massachusetts Institute of Technology. But in the chortling laughter that accompanies Gruber’s boasts about taking advantage of the “stupidity” of average Americans there hides a darker and even uglier truth – there are thousands of little Jonathan Grubers embedded in every state, city and town across America. In a lot of ways, said Goldberg, the Gruber spectacle represents not just everything’s that’s wrong with the Obama administration; it’s everything wrong with liberalism and a lot that’s wrong with America itself. These little Grubers thrive upon abusing their fellow citizens and arbitrarily and capriciously imposing their liberal follies on their neighbors, who just want to be left alone, through the web of aggressive “watchdogs” and regulatory agencies that always accompany supposedly progressive government. Think about what happened to Martha Boneta out in Fauquier County, Virginia when local Grubers, using zoning and land use regulations, sold to the public as preserving open space and the community’s rural atmosphere, suddenly decided to use those regulations to prevent Boneta from actually doing what people who live in rural communities do – farm. 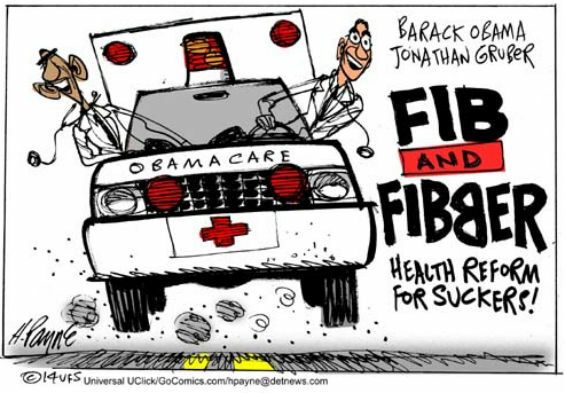 Washington Times columnist and radio host Tammy Bruce wrote recently that “lying like that is like eating potato chips — you can’t have just one.” Jonathan Gruber’s brazen bragging that Obamacare was based on intentional lies and an assumption that the American people are too stupid to figure the lies out reminds us that, be it through Obamacare or your local zoning regulations, deception is almost always the foundation upon which big government liberalism is built.